The 2nd August was Earth Overshoot Day 2017. This means that by this day, we have used more resources than the planet can renew in 2017, and emitted more CO2 than global forests can absorb. The date for Earth Overshoot Day is not fixed. Instead, it is calculated* each year, changing as humanity’s ecological footprint changes. 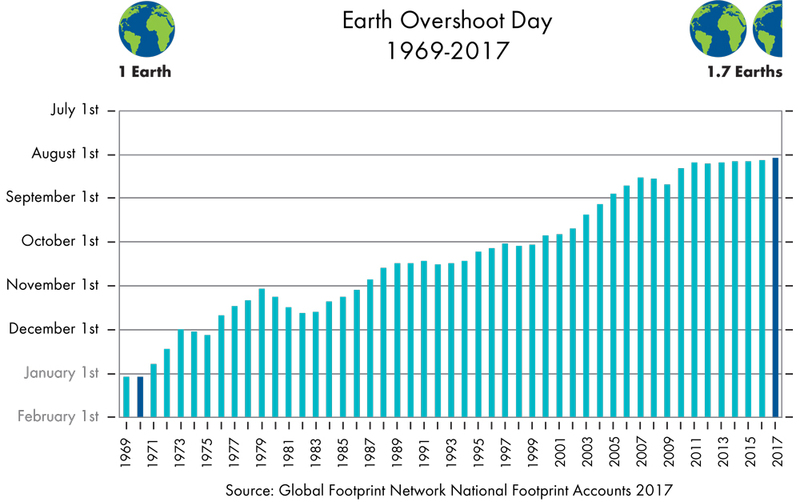 Looking at how the date has moved in recent decades reveals a worrying trend: Earth Overshoot Day comes earlier each year. While it was in November or later in the 1970s and 80s, it moved to August in the 2000s. Earth Overshoot Day comes just days after an article published in Nature Climate Change suggests that based on current developments, there is only a 5% chance that we will meet the target to keep global warming below 2 degrees by 2100. This is the target set in the 2015 Paris Agreement. Instead, there is a 90% chance that our planet will warm by 2.0-4.9 degrees by 2100, which could have potentially catastrophic impacts. With this in mind, what can we do to reduce our carbon footprint? As with many things, the first step could be measuring it. The Global Footprint Network has a calculator that allows you to work out your own Overshoot Day and ecological footprint. WWF also have a calculator that shows you the % of your share of carbon emissions you are using, compared to 2020 emission targets. For many, flying and food will be the biggest contributors to our footprint. A transatlantic flight can emit as much as 1 tonne of CO2, and meat-heavy diets also carry a carbon price tag. As a university, King’s emitted over 35,000 tonnes of CO2 in 2015/16 – this is down 26% from 2005/06, but there is still work to be done to reach the target of a 43% reduction by 2020 and being ‘carbon free’ by 2025. What can we do once we know how much we emit? There are many actions you can take to reduce your own environmental footprint. Why not try out some tasty vegan/vegetarian recipes? Or cycle or walk to university? You can also offset carbon emissions from your flights through various projects. The UN has also created the “Lazy Person’s Guide to Saving the World”, a guide with actions you could take from the sofa, in your home, or in your neighbourhood. Whatever you choose to do, it is important to remember that while actions may seem small, they add up to something big when millions of people around the globe commit to them! *Earth Overshoot Day is calculated by dividing the planet’s biocapacity (the amount of ecological resources Earth is able to generate that year) by humanity’s ecological footprint, and multiplying this by 365. More information here.